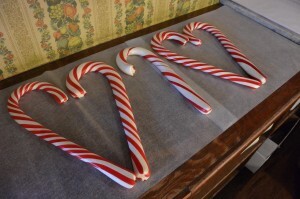 If you’ve ever wandered through Columbia State Park during the holidays, you may have caught a glimpse of the candy makers lovingly creating these delicious peppermint wonders. Here’s a glimpse behind the scenes — the candy canes are still made the old-fashioned way at Nelson’s Candy Kitchen in Columbia. Visitors can watch through the window every Saturday and Sunday at noon and 1 p.m. from the end of November through the weekend before Christmas. If you would like to participate in making traditional candy canes during the holidays, you can send a request directly to us via postcard. We choose participants through a lottery drawing from those postcards. Candy kitchen owner Janice Nelson talks about the delightful history of Columbia's famed candy shop. "a hallmark of a great old-fashioned candy store ... this is the type of place I go way out of my way to visit."